After receiving a distress signal, the USS Enterprise responds with a rescue mission to a planet inside an uncharted nebula. Once arriving at the planet, the Enterprise is ambushed and swarmed with a fleet of small fighter ships led by an alien named Krall (Idris Elba). The crew evacuates, most whom are captured in the process, as their beloved ship crashes down to the planet below. Now, Kirk (Chris Pine) and the remaining crew must find a way to rescue those who are being held captive and stop Krall before he completes his grand plan. "Star Trek Beyond" is the third installment in the new "Star Trek" franchise. Justin Lin, who is most famous for his work with the "Fast & Furious" franchise, has now taken over the directorial duties from series resurrector J.J. Abrams. The entire cast from the previous two films returns to reprise their roles as the crew of the USS Enterprise, including Chris Pine as Captain James T. Kirk, Zachary Quinto as Spock, Karl Urban as Dr. 'Bones' McCoy, Anton Yelchin as Chekov, Zoe Saldana as Uhura, John Cho as Sulu, and Simon Pegg as Scotty, who also co-wrote the screenplay with Doug Jung. 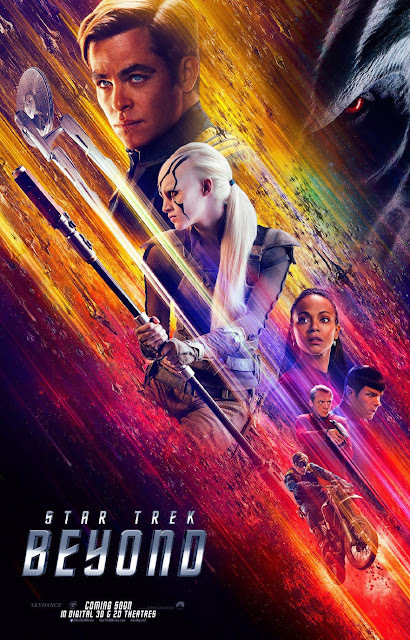 New to the cast are Sofia Boutella, who plays Jaylah, an alien stranded on the planet the Enterprise crashes on, and Idris Elba, who plays the villainous Krall, who leads an attack on the Enterprise and captures Kirk's crew in search of a piece of cargo the ship is carrying. As per usual, and we have really come to expect no less, the regular cast does a phenomenal job bringing all these iconic characters to life for a new generation of moviegoers. This time around, we are treated to some new and different pairings, not just the usual standby "couples" like Spock and Kirk, Spock and Uhura, Chekov and Sulu, etc. In fact, all of these "oddball" pairs, like Pine and Yelchin, who get stranded together with Jaylah and Scotty, as well as Urban and Quinto, who are trying to find Uhura and the rest of the crew, showcase a lot of fun humor with some deceptively deep emotions behind the pairings being thrust together. Urban and Quinto are absolutely wonderful together. Bones and his overly sarcastic ways clash with Spock's literalness, but they somehow manage to convey a deep bond of friendship with one another despite their differences, even if they'd rather be with anyone else but each other. Idris Elba is fantastic addition to this film as a "one-off villain," and conveys a menacing, pervasive presence as Krall. Even behind a lot of prosthetics and makeup, Elba's voice and gravitas is undeniable and allows him to shine on screen. Sofia Boutella is also able to hold her own with this veteran cast and offers great action and dry, Spock-like literal comedy as Jaylah. Boutella and Simon Pegg, who has been regularly known as the comedic relief for this franchise, share the most screen time together, and boy are we glad about this. Scotty and Jaylah have excellent chemistry and banter back and forth with one another as they try to escape their current predicament. The two of these actors were our favorite pairing. We are glad to say "Star Trek Beyond" is a complete and total blast, though some might not agree with us because of its favoring of the more humorous and action-packed moments over the deep-space drama. We had our doubts as the first and second trailers didn't quite captivate us like we had hoped, but you can't judge a movie by its bad trailer these days. This installment in the "Star Trek" franchise is loaded with action and excitement. 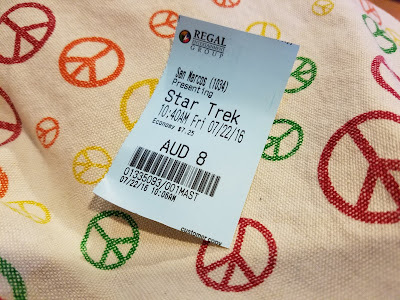 We remain invested in each and every one of the characters both old and new and cannot wait for the next adventure starring all of our favorites, though it will be very difficult to move on without Anton Yelchin's superb portrayal as Chekov and Leonard Nimoy's cameo as Ambassador Spock. Speaking of Nimoy, the 'Star Trek" veteran gets a heart-wrenching, appropriate, touching sendoff more than once in this film that left us teary-eyed. There is a solid story supporting all of the fun and games, one filled with excellent effects and great performances. We could see some thinking the action gets a little cheesy towards the end, but we certainly enjoyed it a whole lot. This is a worthy addition to the resurrected franchise J.J. Abrams began many years ago, and so far, it has shown no signs it is running out of ideas. One year ago, we were watching: "Amy"